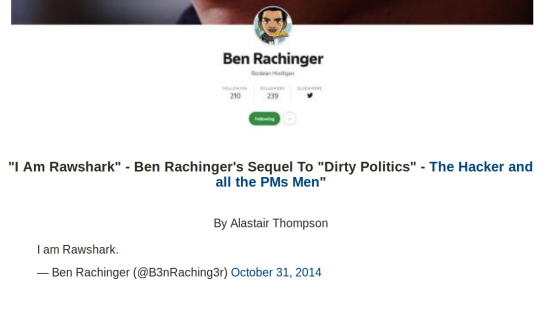 Who could imagine we would witness #DirtyPolitics right-wing blogger Cameron Slater openly blackmailing NZ Herald journalists and ostensibly getting away with it? 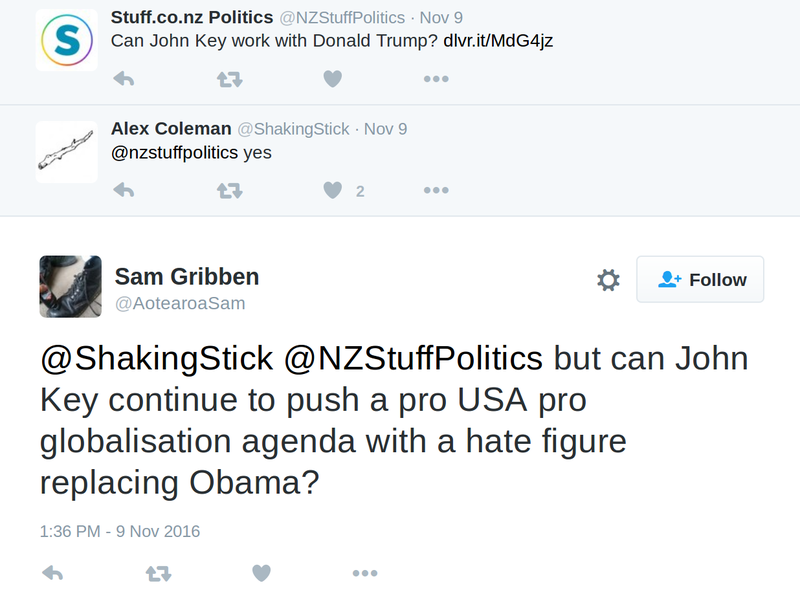 While complaining that he is the victim of “leaks”, it is clear that “leaks” are exactly what WhaleOil and his accomplices trade in. 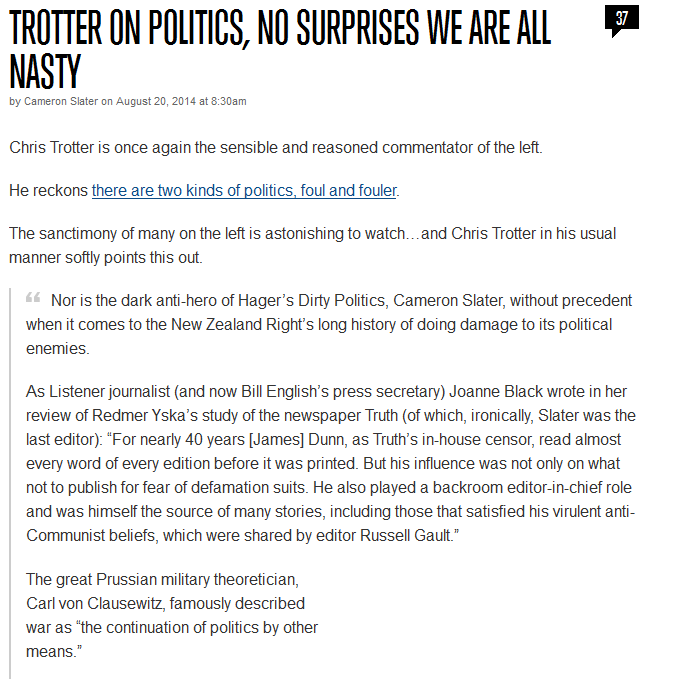 That NZ Herald editors have allowed a situation to continue where their lack of action against reporters leaking information to attack bloggers results in those same bloggers now publicly turning their dirty tactics against those journalists, beggars belief. 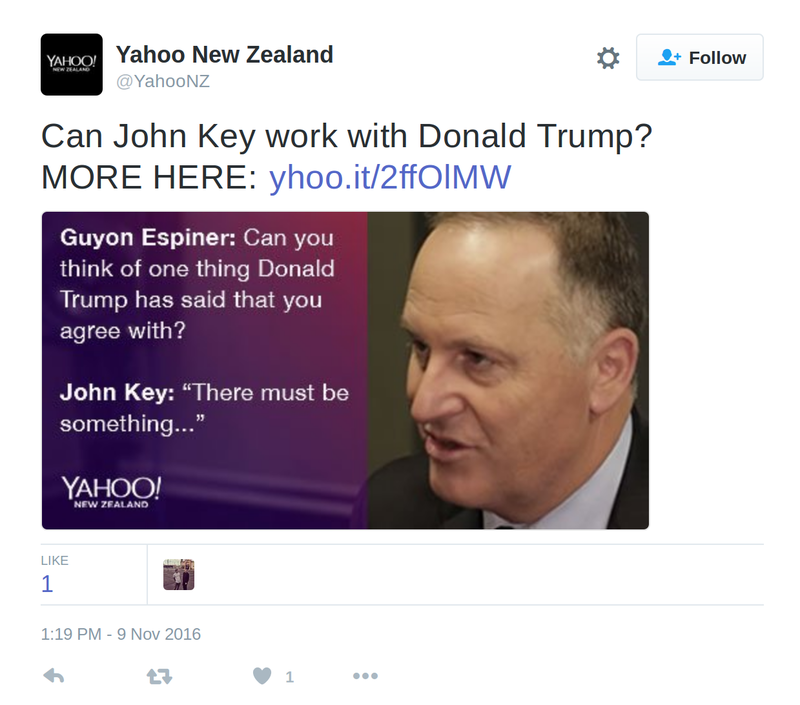 The below article is by much-loved Kiwi blogger Giovanni Tiso (@gtiso on Twitter). Giovanni is a writer and translator based in Wellington. He blogs at Bat Bean Beam and this must-read article has been reposted here with permission. Always there is the temptation to take sides, especially if it’s the side that Cameron Slater isn’t on. 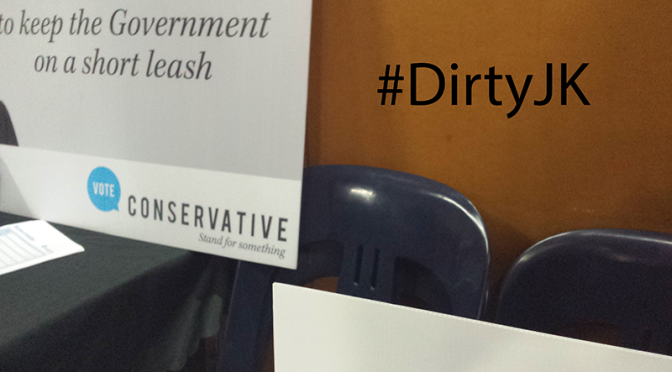 But what we have come to know as dirty politics is a tangle. There are no ‘sides’. Just threads. Pull on the wrong one, and the knot only gets tighter. The redacted email is yet another thread for us to pull. It’s always tempting when you come across a new one. 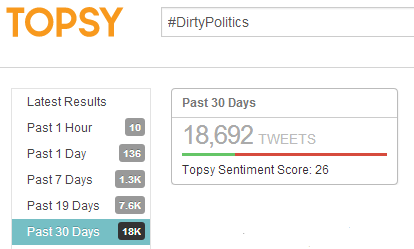 The week after Dirty Politics came out, I wrote of the struggle that might ensue within media organizations and of our likely role as spectators unable to influence its immediate outcome. I also suggested that if it was ever going to become a question of the media versus the public, the public would lose. It hasn’t quite come to that yet, but there are signs of entrenching within the profession. Complaints that the critics are becoming too loud and the criticisms too harsh, especially on social media, with no apparent awareness that mounting frustration might be the source of the outbursts and attacks. 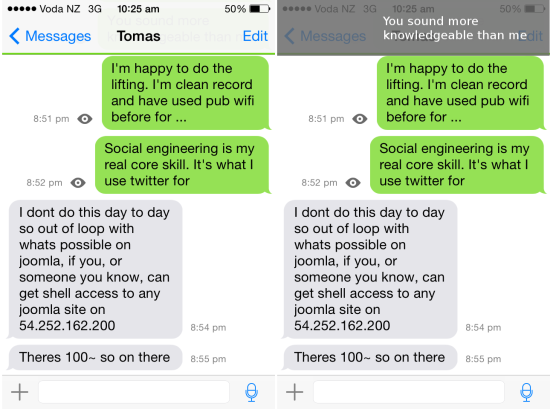 And so it was that Patrick Gower – who some weeks ago lamented how Twitter had stopped being fun – finally lost his patience, along with what was left of his self-awareness. I understand wishing to be left alone, sometimes, and I’m sure that not all of Gower’s botherers have issues of public interest foremost in their minds. But there are too many questions there aren’t being answered, too much carrying on as if nothing had happened, for journalists who built their careers on playing the game the hard way to cry ‘leave me alone’. 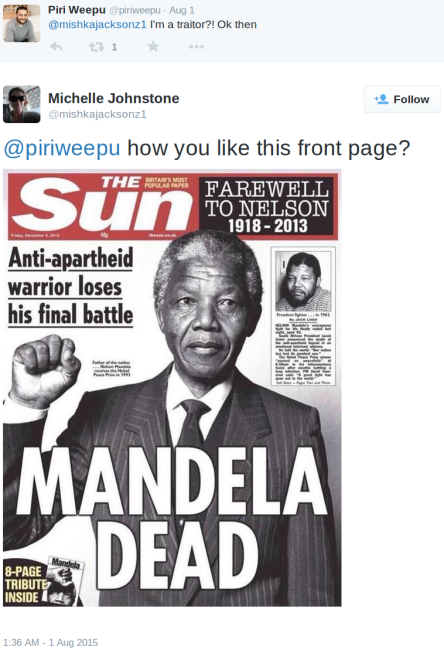 Then there are the ex-journalists. 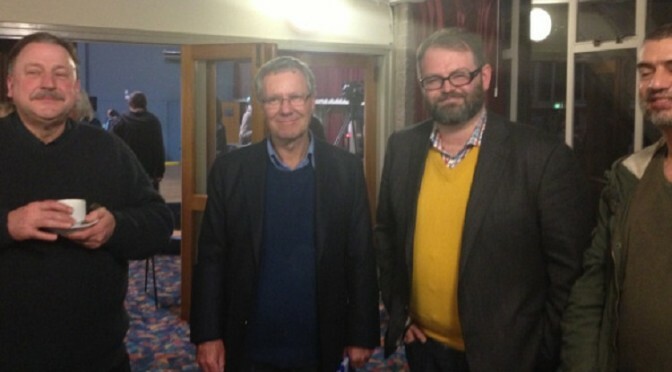 Like Colin Espiner, former political editor for The Press, long-time columnist at the Sunday Star Times, now external relations manager for SkyCity; or Bill Ralston, former head of news at TVNZ, still weekly columnist at The Listener, still regular commentator on radio and television, celebrity speaker and principal – along with the missus – of a communication company specialising in ‘media training, political strategies and crisis management’. Upon learning that an investigative journalist had his house raided by the police and personal as well as work documents seized, what these stalwarts of the profession chose to be angered by was the fact ordinary citizens were paying money into his legal fund. 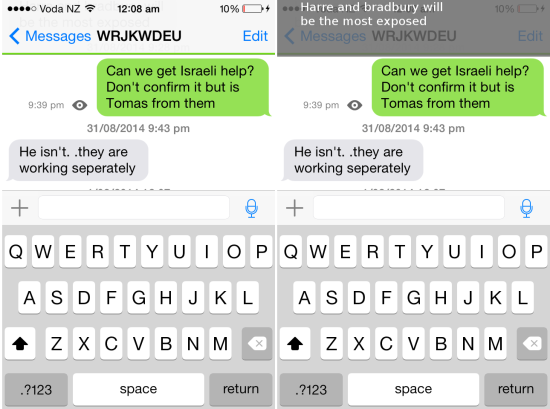 Jealousy and resentment are perplexing feelings to harbour towards somebody like Nicky Hager, except perhaps by the people mentioned in his books. And sure, these two are no longer practising journalists, but I would put forward that the former political editor of a major newspaper and the former head of news of our state broadcaster are still representative of the culture, most especially at the managerial level. However the greater issue is the sheer weight of what hasn’t changed: on the wake of a scandal which engulfed the media, there have been no resignations among executives or reporters, nor to my knowledge has any print, radio or television editor signalled a change in the way things will be done and who will be asked for comment on politics and policy. In no particular order: Rachel Glucina is still employed by the newspaper she was using as a mouthpiece for the Minister of Justice. 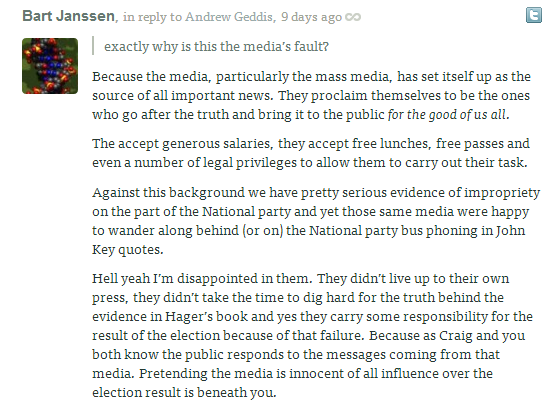 Cathy Odgers was approached by the New Zealand Herald to comment on the political campaign, and the column might well have gone ahead if she hadn’t pulled out herself. 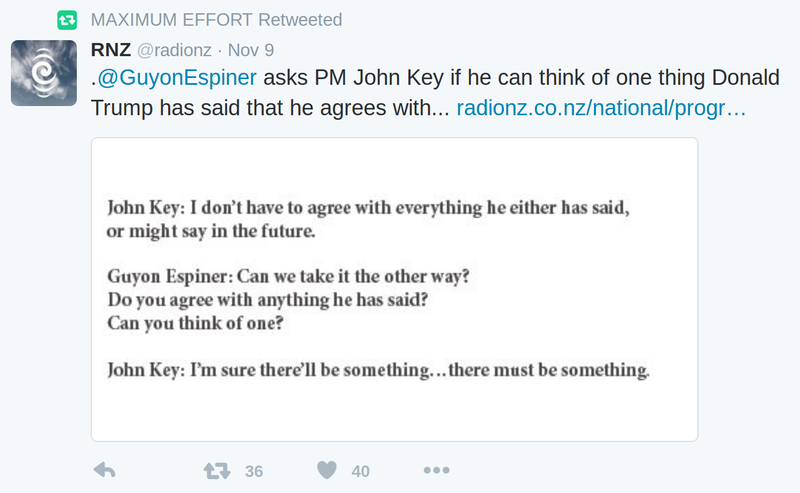 Matthew Hooton admitted to Kathryn Ryan his role in the ‘chop chop for Nicky’ affair, and has kept his half-dozen jobs as a political commentator and columnist, including on the public airwaves. 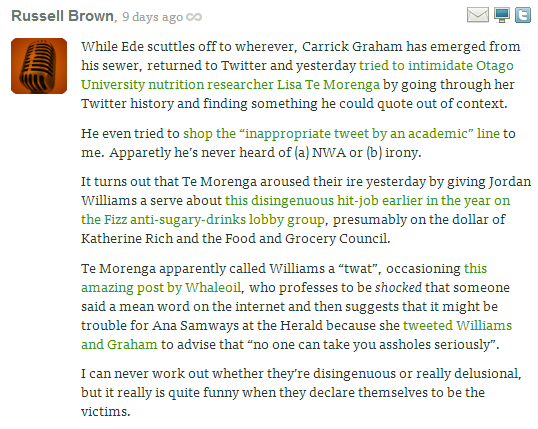 Jim Mora continues to invite representatives of a Tory front organisation and the likes of Stephen Franks – whose legal firm made use of Whaleoil – on his popular show at Radio New Zealand. 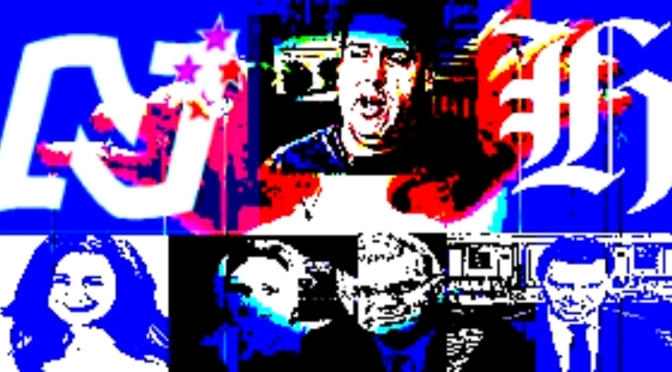 Cameron Slater remains a commentator for Newstalk ZB (which led Wendyl Nissen to resign her job at the station), as is Jordan Williams (which led Helen Kelly to resign), as is David Farrar. So maybe reporters working for those same organisations – and the list is hardly exhaustive – may wish to reflect on why their calls for the resignation of politicians or appointees are not always as forceful and effective as they seem to think they should be. 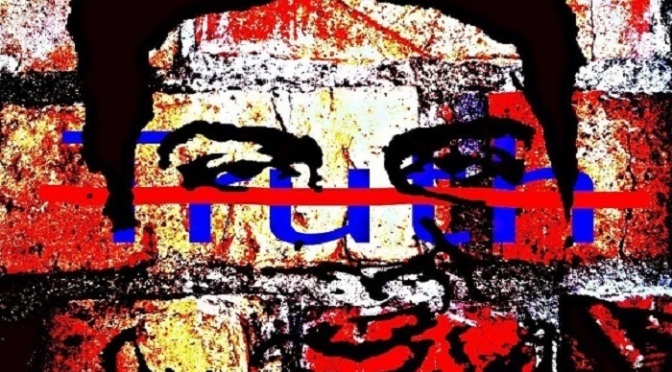 There has been some excellent reporting done on dirty politics, but it counts for little so long as some of the main players in the story – all of whom have been variously shown to be in the business of manipulating as opposed to informing the public – are going to continue to occupy their privileged, unchallenged platforms. It does not serve either balance or plurality for us to continue to hear from them. 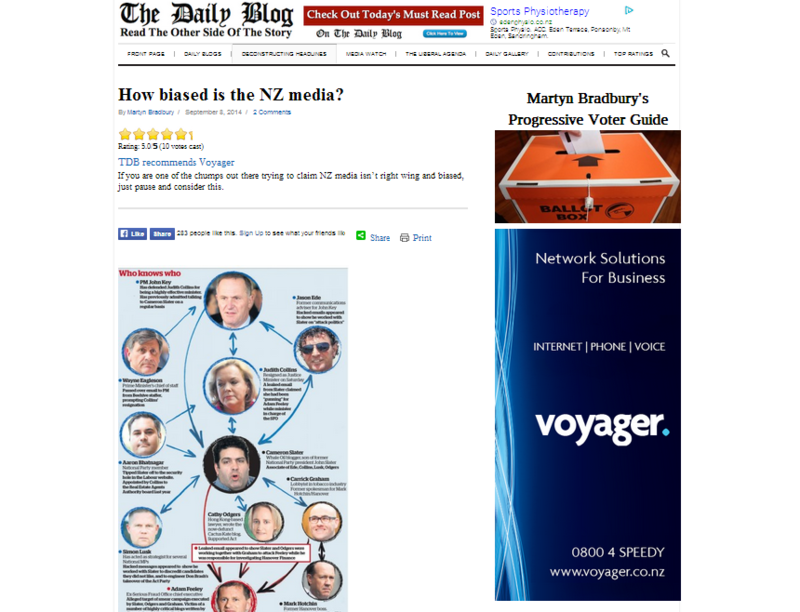 And so, if I decided to pull on the thread and follow up on the redacted email, it was not to do Cameron Slater’s bidding in his campaign to get the New Zealand Herald to shut up about dirty politics, but because I don’t think we’re asking enough questions about dirty politics. The Herald, remember, is still not disclosing the documents that formed the basis of the Donghua Liu reports filed by Jared Savage in June of this year. 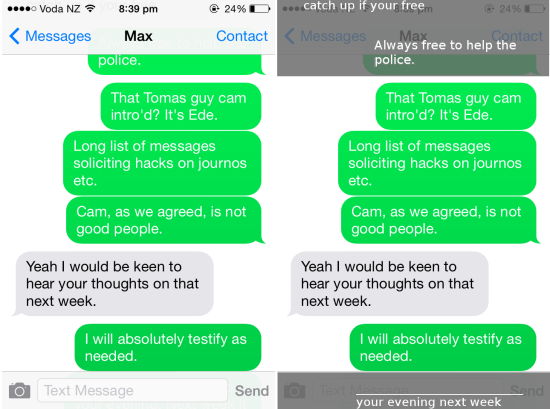 Savage, in turn, has admitted to passing information on to Cameron Slater in the Feeley affair, three years earlier. The link isn’t casual, and the possibility that the Liu stories were part of an orchestrated attack on Labour at the outset of the election campaign is very concrete. So where’s the reporting on this relationship? Who is questioning the reporters? To be fair, Morning Report did interview Herald editor-in-chief Tim Murphy on Donghua Liu. But when the Feeley email was released to the press, raising significant concerns about the conduct not just of a cabinet minister but also of two senior reporters, the latter got to respond on the Herald’s website and that was that. So far as I can tell, no further explanation was sought or given. 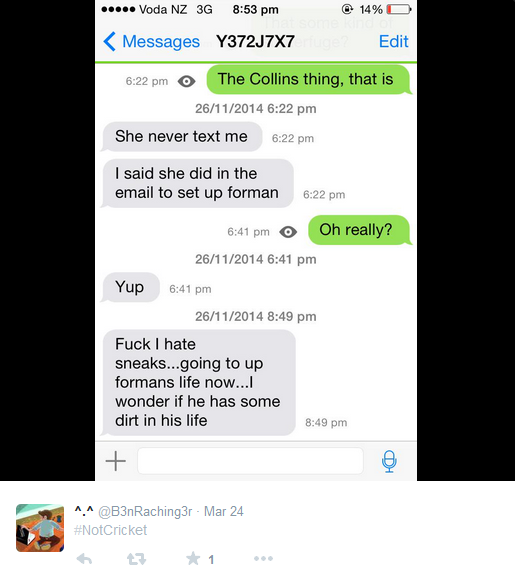 In his response, Savage explained that he forwarded some emails on to Slater as part of an information sharing or ‘horse trading’ arrangement. This sometimes happens with journalistic sources and it’s naive to think otherwise. […] I didn’t know that our conversations about Feeley were being shared with others, like PR man Carrick Graham – and that was naive of me to think otherwise. This struck me as chilling at the time, but also indicative of a surprisingly common attitude from within the industry, a perplexing combination of hard-nosed pragmatism (you should know how things work, son) and bewilderment at how information could get into the wrong hands once it’s passed through the hands of a journalist. Savage says it well: you people are naïve; I was naïve. This naivety serves a double function: to explain and to absolve. You could say that there’s an element of exchange in many interactions between journalists and sources, but I don’t think it’s particularly common for journalists to trade information with their sources in that way. But Slater was a strange fish — he was both wholesaling and retailing scuttlebutt on behalf of others. Wholesaling it to journalists, retailing it in his blog. Inside of that relationship, the wholesaling and the retailing, a number of people had their lives dragged. 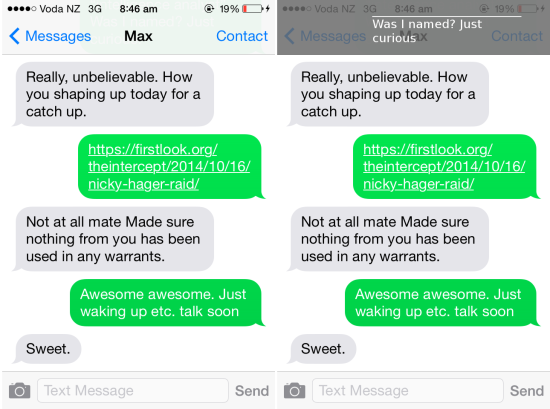 And while Nicky Hager is constantly questioned about the ethics of his working with stolen correspondence, none of the reporters who have collaborated with Slater have had to defend the public interest value of their stories against the danger of exposing others to Whaleoil. Yet that is also where the naivety defence falls apart: for nobody can claim not to have known what that blog was about. There is no excuse. I asked Jared Savage if he’s the author of the redacted email which may not even be real. He responded courteously that he would not comment pending Justice Chisolm’s inquiry. I asked David Fisher, who said that he wasn’t, and that he never traded information with Slater back when he had dealings with him. I asked Shayne Currie and Tim Murphy separately for comment. None has been forthcoming. 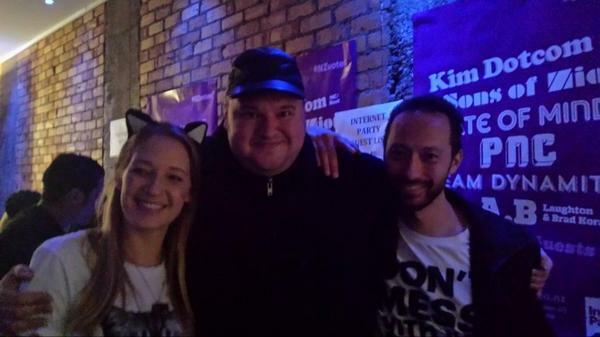 “A couple of years ago Kim Dotcom was a fairly popular person in New Zealand” opens Farrar. Farrar conveniently fails to mention that this is because the mainstream media built Dotcom up to be the greatest thing since sliced bread. Predominantly because his monied and flamboyant image fit perfectly with their cause celebre` consumption of valuable “news” time that is more often “tabloid” time. “National MPs and candidates I spoke to have all said that the most common topic of conversation in the last week was Kim Dotcom” says Farrar. Again he is correct but fails to mention that those people in doing so, are purely regurgitating the anti-Dotcom narratives slung about by the mainstream media on a daily basis. Rather than addressing the content of Snowden’s revelations, or analysing the importance of the disclosures, the media declared “The Moment of Truth” event, with its sell-out crowd, standing ovations and hundreds of thousands of livestream viewers “a fizzer”, instead continuing their (in some cases spoon-fed) Dirty Politics campaign of anti-Dotcom attacks. Most notable, the appalling ‘Moment of Truth’ press conference, where they failed to ask Pulitzer Prize winner Glenn Greenwald questions relevant to his reporting, instead rudely lambasting him about Kim Dotcom (who finally got fed up and famously dished it back). 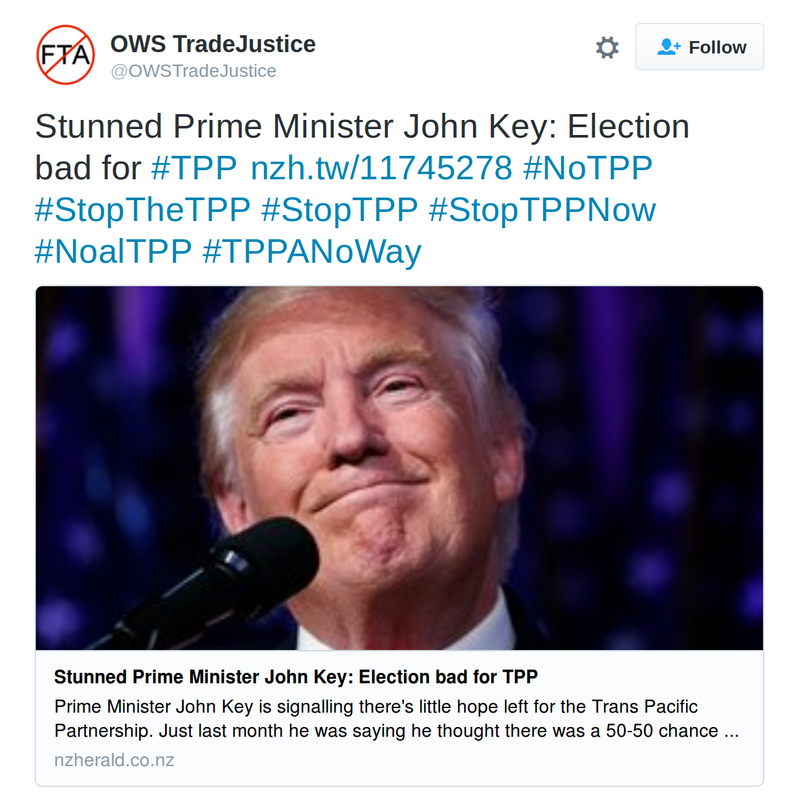 “If Dotcom had not invented a conspiracy theory that Barack Obama and Joe Biden got John Key to let Dotcom into NZ, so he could be arrested and extradited, he would have stayed relatively popular” Farrar states. “New Zealanders are quite egalitarian, and don’t like a guy who flies everywhere in a helicopter leaving small NZ businesses out of pocket for tens of thousands” says Farrar. Farrar quickly follows on from claiming Dotcom didn’t pay people to stating “If he had only put $500,000 or $1,000,000 into his pet party, there may not have been such a reaction. But $4.5 million looked obscene”. 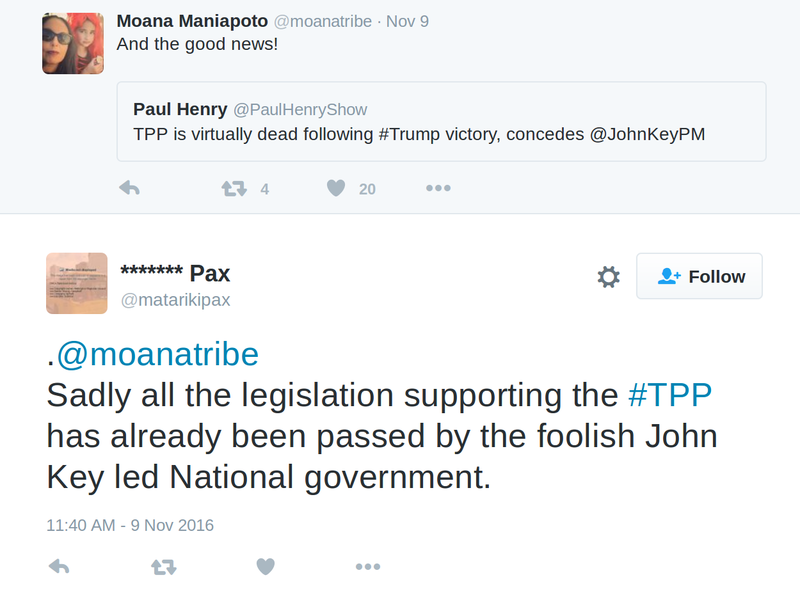 Farrar moves on to attacking the Internet Mana alliance. 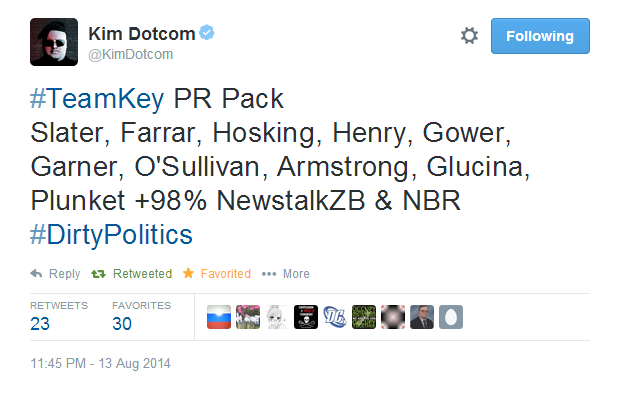 “Dotcom and Mana were seen to have almost no policy commonality” he writes. Funnily enough the Loomio-powered policy incubator was one of the most-discussed things in alternative media and the least discussed in the mainstream. Keith’s conciliatory, gently chiding and in some places very generous approach to the media was no doubt intended as a kind of bridge… a pacifying voice, almost an olive branch. “Journalists haven’t been lazy this election, nor have they been biased” Keith writes. “They hit Dirty Politics hard for weeks and they’re pretty indignant at people heaping scorn upon them” says Keith of the mainstream media. But the scale of the allegations in the book require more than just discussion, they require reform of both our national politics and our national media, yet there is no indication that this reform is occurring, or is likely to. Indeed the media openly decry Dirty Politics as “business as usual” and brag of their own advanced knowledge of it as if it increases the prestige of their privileged as “insiders” rather than reflects on their own failure to inform the public of what has really been going on within our “democracy”. Legendary Kiwi social commentator Sacha Dylan brilliantly captures the ongoing tussle between Kiwis and the mainstream media in this fascinating post – “Reporting in the wake of Dirty Politics“. And we have the corporate media narrative that people are just being mean to them. 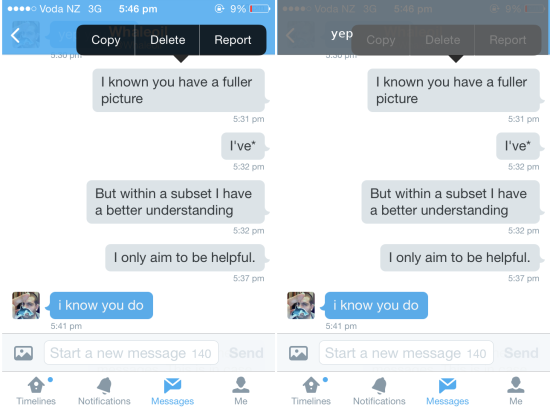 Rather than self-reflection, they instead appear to blame… Twitter. 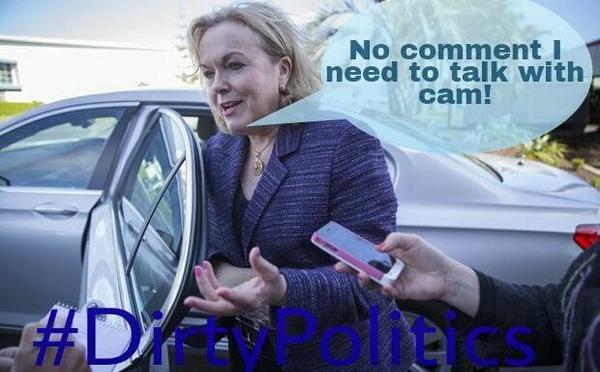 Human Rights activist and Internet Mana Party candidate Miriam Pierard (pictured above left) recently got her first taste of the dark underbelly of the NZ media jetset. 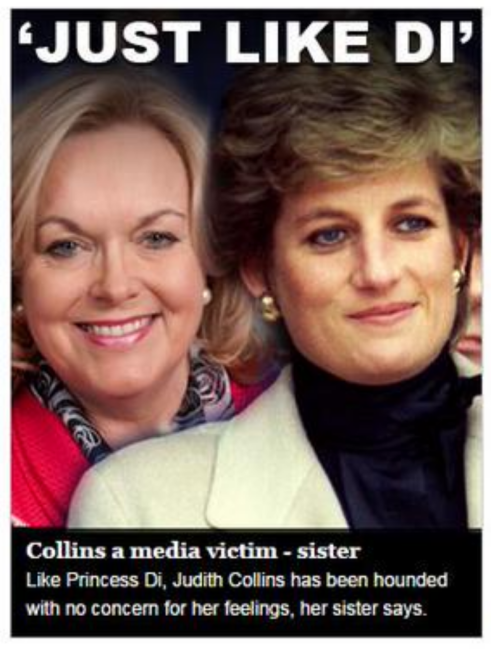 NZ’s largest gossip columnist, Rachel Glucina, hijacked the above picture (which had been donated to Occupy New Zealand by unpaid volunteers) and used it as the basis of a sloppy, snide attack on Miriam, published by the NZ Herald website, New Zealand’s most well known print and online “news” publication. 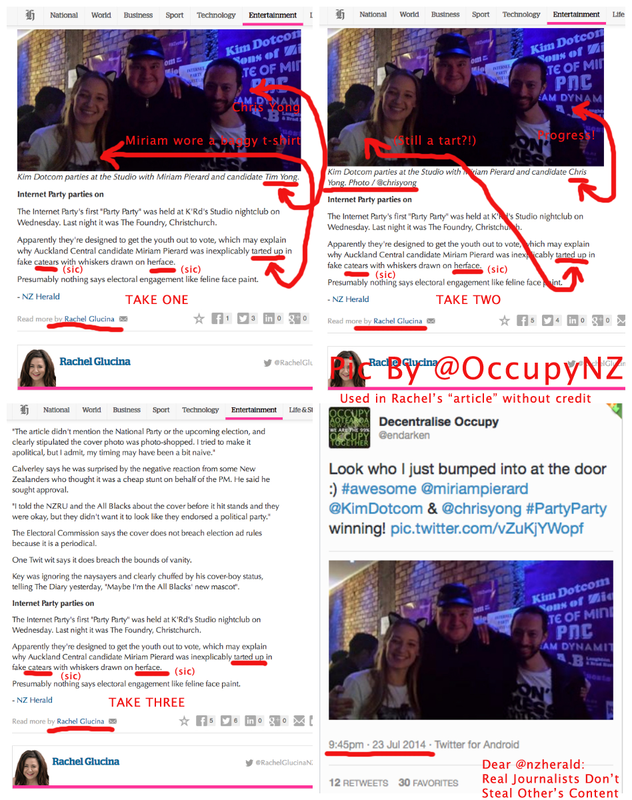 Unfortunately for Rachel Glucina, Miriam’s fellow Internet Mana Party candidate Chris Yong spotted the article and recognised the uncredited photo as having been lifted from a #PartyParty livetweet by Occupy NZ admin @endarken that had been retweeted by Kim Dotcom. Repeated attempts by @OccupyNZ to extract an apology out of both Rachel Glucina and the NZ Herald resulted in stone cold silence from the perpetrator(s), yet the article underwent a series of bizarre online changes – from publishing the pic with no attribution and bizarrely referring to Kiwi rock legend Chris Yong as “Tim Yong”, to later falsely attributing the pic to @chrisyong, to his chagrin, to then backtracking and deleting the pic altogether. 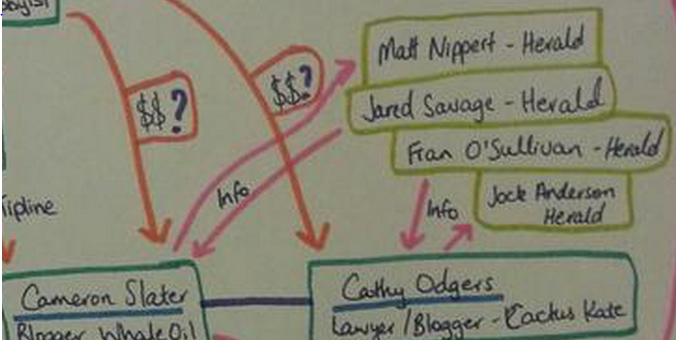 Consequently the Occupy NZ Media Team created the below infographic to timeline the metamorphosis. One might wonder what stake Rachel Glucina had in presenting the very girl-next-door Miriam as tarty when in reality Miriam was wearing a baggy t-shirt and leggings. Perhaps if Rachel had better scrutinised the photo she published unaccredited as if it was her own, she could have seen that the image itself actually disproved her baseless assertions. 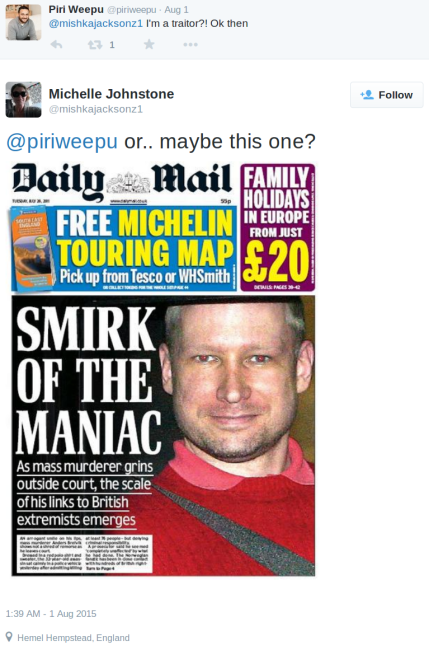 Once the photo was eventually removed, the remains of the article made little sense. 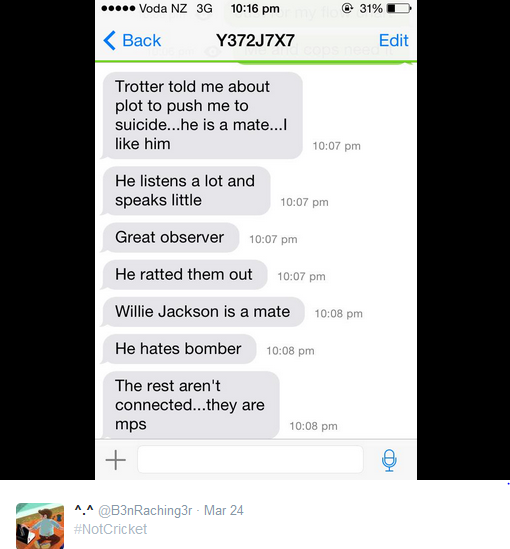 Perhaps the only sense to be made of Rachel’s motives at all, is the content that appeared above her hit piece on Miriam – a shallow dissertation where she brags about having enjoyed a helicopter ride with the recently convicted ex-Minister John Banks, immediately followed by a gushing promotional piece on the Prime Minister, John Key. 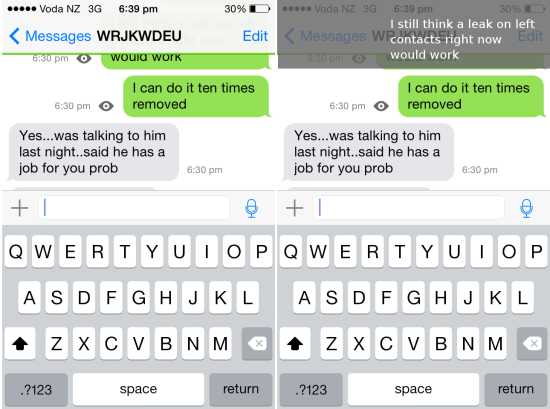 Incidentally, Mr Key also has a dubious past where copyright is concerned. 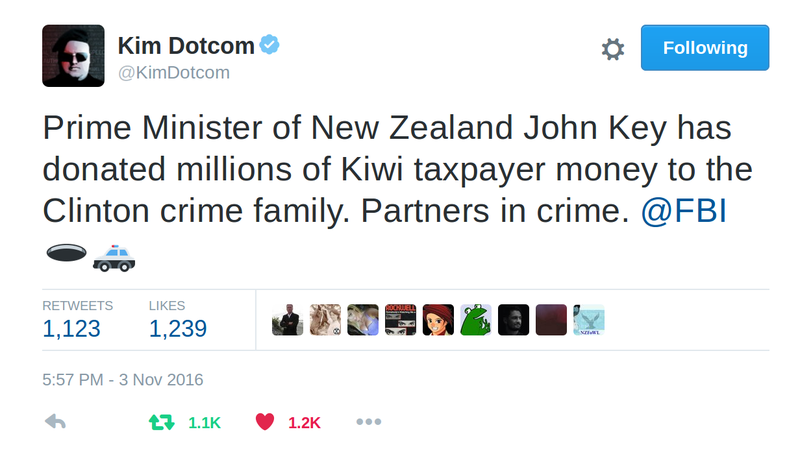 John Key is of course, the Minister in charge of the GCSB (NZ’s NSA) and arch-nemesis of Kim Dotcom – Internet Party visionary and MC of the event at which the photo Rachel Glucina misappropriated, was taken. 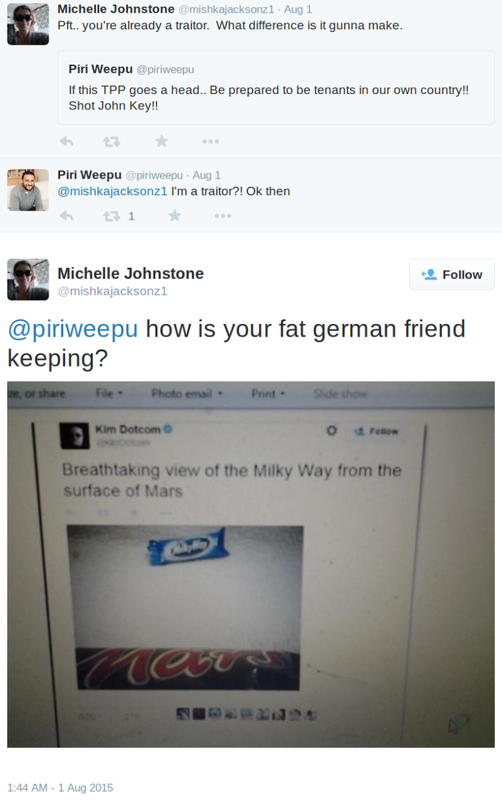 The corporate media in New Zealand and its spin doctors have made much of Kim Dotcom’s alleged copyright violations – yet so far have failed to expose Rachel Glucina’s.